The New York Times has retained Newmark Grubb Knight Frank (NGKF) to market 250,000 s/f of office space at its iconic Times Square headquarters building. NGKF announced that the legendary newspaper is reconfiguring its own space in the skyscraper at 620 Eighth Avenue and will vacate a total of eight floors. The Times hired Gensler and NGKF’s workplace solutions teams to analyze its occupancy at the Renzo Piano-designed landmarked to make more efficient use of the space they occupy and better facilitate the ongoing digital transformation currently underway at the company. The move will create extra space on floors nine through 11 and 16 through 20, each with a floorplate of 31,000 rentable square feet, available for new tenancy. 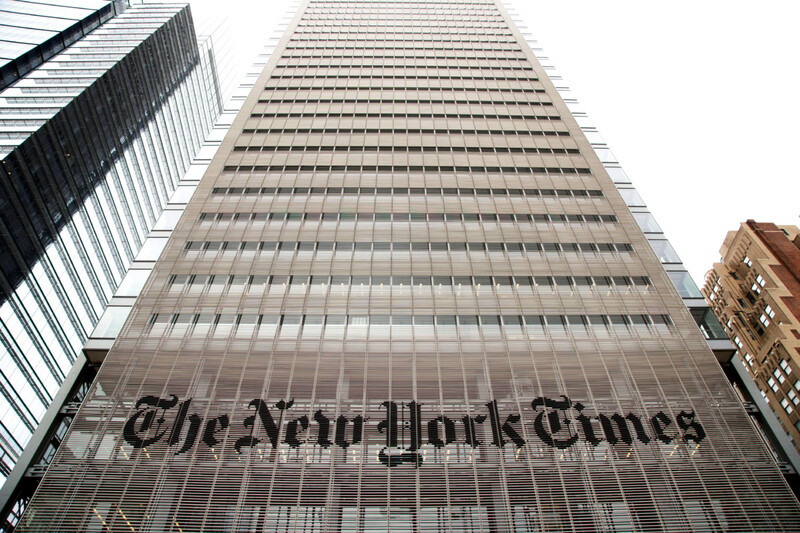 NGKF executive managing director Andrew Sachs and senior managing directors Bill Levitsky and Ben Shapiro are marketing the space on behalf of The New York Times Company. “The continuing trend of tenants designing a collaborative, efficient workplace environment to attract and retain talent, in combination with the benefits of new construction, aligns perfectly with the available floors at 620 Eighth Avenue,” said Sachs. Built in 2007, the tower was designed by Renzo Piano Building Workshop and FXFOWLE Architects, with Gensler providing interior design. 620 Eighth Avenue features floor-to-ceiling glass, a unique lighting design and underfloor HVAC system. The design has environmentally sustainable features for increased energy efficiency.